Need a new product, but don’t want to spend a fortune to get it? With WorthIt.co, you can search for a product, name your price, then they’ll find it for you. If you’re looking to shop AND save money, make it “Worth It”! Everyone needs something, no matter how large or small and this is a great way to do that and save money at the same time, this is a brilliant idea. 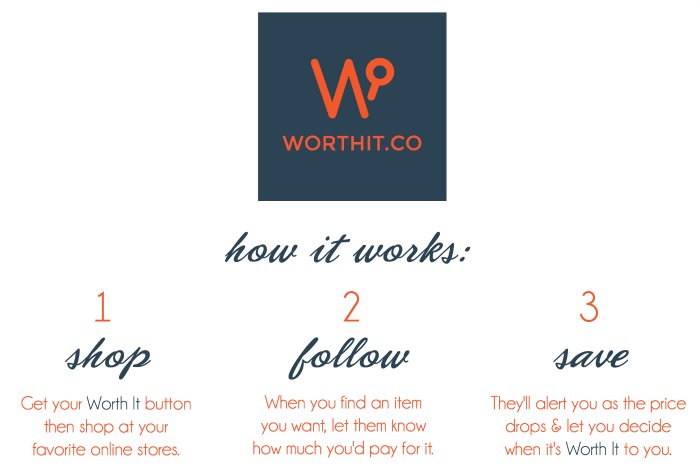 Here’s how WorthIt.co works: Download the FREE WorthIt.co app (it’s available on iOS so you can search from the palm of your hand) or use their website. Then, search their trusted list of retailers (like Amazon, Target, Walmart, REI, BuyBuy Baby, Nordstrom – basically, all of your favorites) for products that you’re interested in purchasing. Once you’ve found the product you’re looking for, WorthIt.co will show you the best deal. You can choose to buy it, or name the price that you’re willing to pay. WorthIt.co will then continually search for your price and once they find it, they’ll send you a push notification and/or an email alert and you can decide if it’s “worth it” to you. Every email or notification is going to save you money! You can even use this app as a “price-checker” to follow items you use everyday, like diapers, wipes, formula, cleaning products – you name it. There’s no limit to the amount of products you can follow, so whether it’s new shoes, an eReader, or a new jogging stroller, WorthIt.co searches for the best prices on all of your items from reputable dealers around the globe. When your price is found, WorthIt.co will let you know. Viva Veltoro recently had the chance to review the WorthIt.co app. Be sure to check out here thoughts! 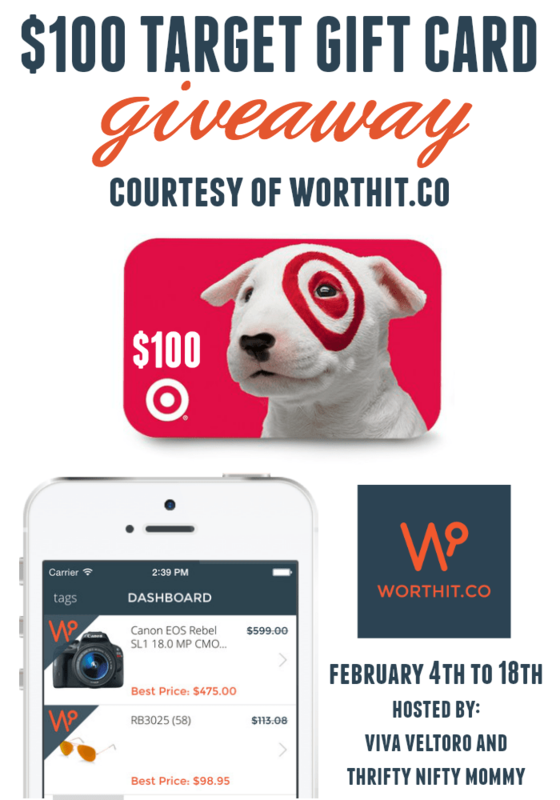 a $100 Target Gift Card to get started using their app! Open to the US only, ages 18 and up. Ends at 2/18/15 11:59 PM EST. Disclosure: This giveaway is hosted by Thrifty Nifty Mommy and Viva Veltoro, and generously sponsored by WorthIt.co. Thrifty Nifty Mommy, Viva Veltoro, and the participating blogs are not responsible for prize fulfillment. Please contact vivaveltoro(at)gmail.com with questions about this giveaway. One winner will be randomly selected using the Giveaway Tools random selector and notified via email. Once notified, the winner will have 48 hours to respond or a new winner will be chosen. This giveaway is in no way associated with Facebook, Twitter, Instagram, Pinterest or Google. Void where prohibited.